When Sean Connery returned to the role of James Bond in Diamonds Are Forever, not only was he paid the highest salary ever for an actor but also was no expense spared on his wardrobe. 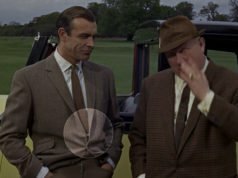 The film has the highest number of bespoke tailored garments—suits, dinner jackets, blazers and sports coats—of any James Bond film. At least one extra suit was also made, a brown pinstripe suit that was sold at auction in 1998. Connery had no shortage of bespoke shoes from John Lobb Ltd for Diamonds Are Forever either. John Lobb Ltd is a bespoke shoemaker and bootmaker on St James’s Street in St James’s, London. Founded in 1849, it has long been the preferred shoemaker of British royalty and currently holds royal warrants from Prince Philip and Prince Charles. In 1902 John Lobb opened a shop in Paris, which was run the same way as the bespoke shop in London but with its own shoemakers. In 1976 the Paris shop was taken over by Hermes, and they developed a ready-to-wear line that is currently made in England in addition to the Paris bespoke operation. The John Lobb St James’s and John Lobb Paris brands have been completely separate entities since 1976; the bespoke shop on St. James’s Street is the only shop affiliated with the original John Lobb. All ready-to-wear shoes with the John Lobb name and all John Lobb shops other than the St James’s Street shop are a part of John Lobb Paris. Even when the London and Paris shops were under the same ownership, they operated independently from one another. Thus, the ready-to-wear John Lobb shoes that Daniel Craig wears in Casino Royale are not from the same brand that Sean Connery’s London bespoke John Lobb shoes are from. James Bond wears eight styles of shoes in Diamonds Are Forever, and most, if not all, are from John Lobb Ltd. Being a very traditional company, the shoes they present on their website are exactly the same as the shoes they made for Sean Connery in 1971. Hence, the shoes are mostly easy to identify. Little has changed about the way they make their shoes in the history of the company. 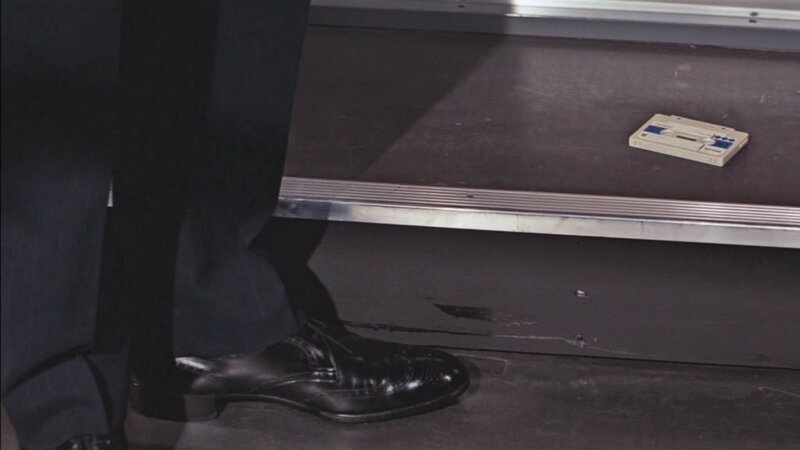 Thanks to Guy Hamilton’s directing, we see many shots of these shoes throughout the film. The black stitched-cap-toe oxford is the quintessential business shoe. On a trim last and devoid of ornamentation, this is one of the dressiest shoes apart from those worn for traditional court dress or evening dress. The oxford, which is known as a balmoral in America, is characterised by closed lacing. Lobb’s oxford laces with five pairs of eyelets, which is the standard on English oxfords. It has a single leather sole with a bevelled waist, which means the sole at the narrowest part of the shoe is carved away to make the waist look even narrower and the shoe look more streamlined overall. The formality of this shoe, especially when made in such a trim-looking manner as Lobb makes theirs, is most at home with a lounge suit or morning dress and can be too formal with anything less than a suit. James Bond wears this oxford with his black and white glen check suit in Amsterdam. One unusual feature of the oxfords in Diamonds Are Forever is the heel counter, an extra piece of leather that is sewn to the back of the uppers above the heel. It stiffens the back of the shoe to give more support to the foot as well as to strengthen this part of the shoe. Heel counters are a standard feature of half brogues and full brogues, but they go against the principles of the sleek design of the stitched cap-toe oxford. Considering how much of a beating these shoes take in James Bond’s fight with Peter Franks, the heel counter makes Bond’s oxfords more battle-ready. See this shoe, but without the heel counter, at John Lobb Bootmaker. The V-front derby, which laces with three (or sometimes two) pairs of eyelets with the open quarters framing the vamp in a V-shape, is a Connery Bond classic. The style appears in Dr. No, From Russia with Love and Goldfinger with a plain toe or cap toe, but it does not return again until Diamonds Are Forever. This time it comes in the form of a full brogue, which means it has a wing-tip toe with a medallion, broguing (perforations) along all seams and a heel counter (an extra piece of leather around the back of the upper above the heel). Full brogue shoes are usually made in an oxford style or a five-eyelet derby style. The V-front style with full-brogue details is an uncommon style and is rarely available in ready-to-wear shoe ranges. The traditional five-eyelet derby style in a full-brogue may look too clunky to wear with a worsted lounge suit, but in the three-eyelet V-front style and in black calf this full-brogue looks more elegant and appropriate to wear with a suit. A single-leather sole with a bevelled waist adds to the shoe’s dressiness. 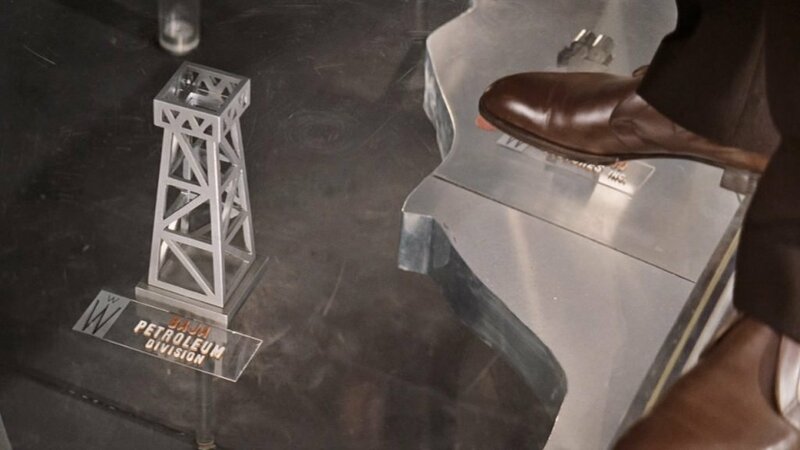 James Bond wears these shoes with three suits—the black three-piece suit at the funeral home, the light grey suit in Las Vegas and blue chalk stripe suit on the oil rig—making these his main shoes in the film. 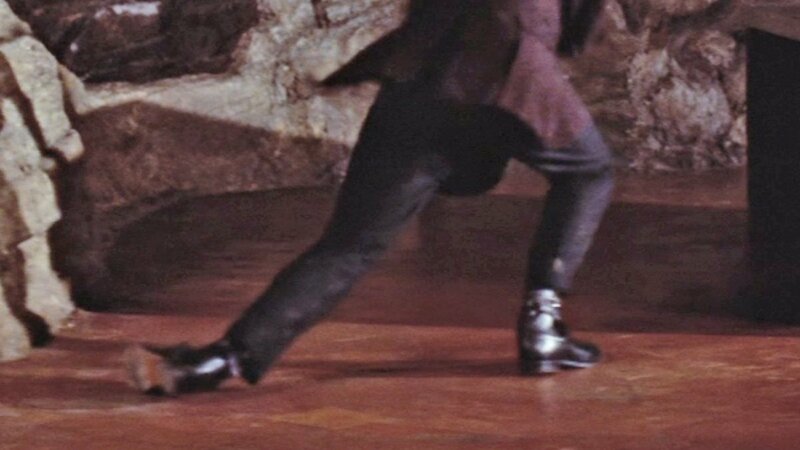 He also wears these shoes with his velvet dinner jacket at the end of the film instead of proper patent leather evening shoes. See this shoe at John Lobb Bootmaker. Bond wears a second three-eyelet V-front derby in Diamonds Are Forever, but this one is in the more traditional plain toe style. In light brown it is a less formal shoe than the black full-brogue V-front, despite the more formal plain-toe design. The light brown shoes pair well with Bond’s light-coloured cream linen and silk suit at the very start of the film in Japan. 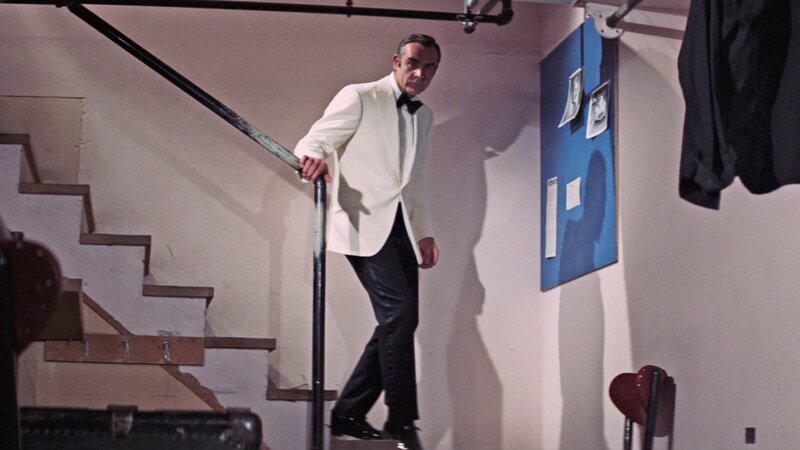 The V-front derby is one of Sean Connery’s Bond’s favourite shoe styles, and he even wears it in patent leather for black tie in Diamonds Are Forever. While the closed-laced patent leather oxford is the traditional lace-up choice for black tie, the V-front derby also gets the job done without sacrificing elegance. For an extra-elegant look, these shoes are made on an extra-thin sole that is coloured black on the bottom. Unlike the other V-front shoes in Diamonds Are Forever, these shoes have only two pairs of eyelets instead of three. These shoes are also made on a different last from the other shoes in the film; it is more modern with a chiselled toe instead of the traditional rounded toe. This may signify that the shoes are not from Lobb. For the average man who does not frequent black tie functions, a plain black calf oxford can serve double-duty for both suits and for black tie. But when James Bond wears three different dinner jackets in one film he has no excuse to not have a dedicated patent-leather shoe for black tie. He wears this shoe in Diamonds Are Forever with his ivory dinner jacket at the casino and his black dinner suit when scaling the Whyte House. Daniel Craig wears a similar shoe in black calf instead of patent leather from John Lobb Paris for black tie in Casino Royale. John Lobb does not present any two-eyelet derby shoes on their website like these, but as bespoke shoemakers it is only a small change to their usual three-eyelet style and something that they would be able to make. But as stated above, these shoes may not have been made by Lobb due to the uncharacteristic last. Though this kind of last would be possible for Lobb to make, making a separate last for these shoes—one of the most labour-intensive steps of bespoke shoemaking—would have been less likely for a film production. The black patent leather plain-toe oxford is a traditional shoe for formal eveningwear. 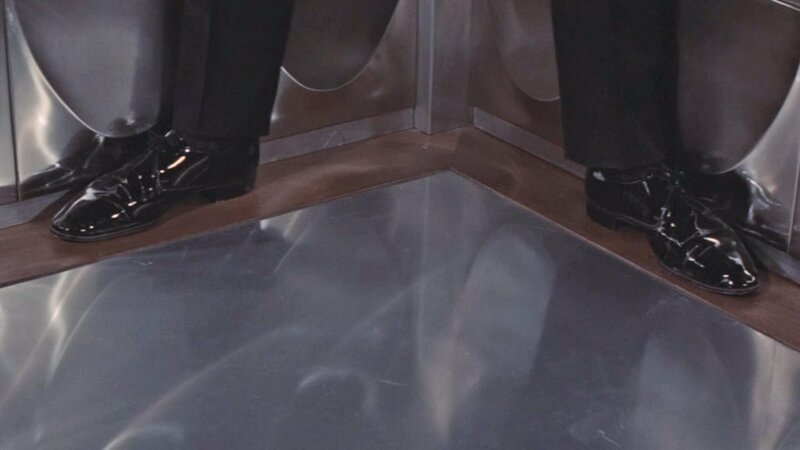 Bond wears this shoe in Diamonds Are Forever with his ivory dinner jacket and his black dinner suit as an alternative to the V-front shoe, but it is not visible in any close-ups in the film. The closed lacing and plain toe make this a very formal shoe. See this boot at John Lobb Bootmaker. “Hilo” is John Lobb’s name for a chukka boot, which is a short ankle boot with open lacing that usually laces with two pairs of eyelets. The model that Bond wears in Diamonds Are Forever fastens with a strap and buckle like a monk shoe instead of with laces. Like on monk shoes and chukka boots, the quarters are sewn over the vamp. Having a strap rather than laces changes little about the boots and does not alter the way they can be worn or how formal they are. The boot has double-leather soles for a sturdy and sporty look. Bond wears these boots twice in Diamonds Are Forever, first with the cream linen and silk suit when meeting Bambi and Thumper and subsequently with the checked tweed jacket. The heavy look of these boots makes them much more suited to the tweed jacket than with a light linen and silk suit, which is better paired with the light brown V-front shoes from the start of the film. 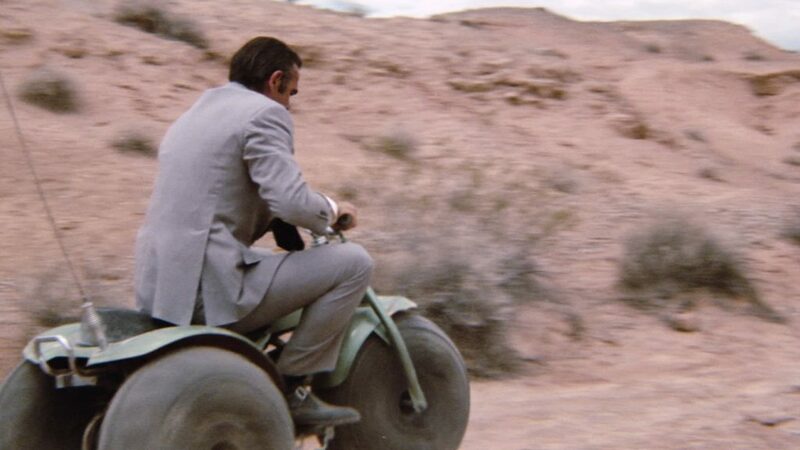 Bond wears another pair of strap Hilo boots very briefly with his light grey suit in Las Vegas when riding a motorbike. 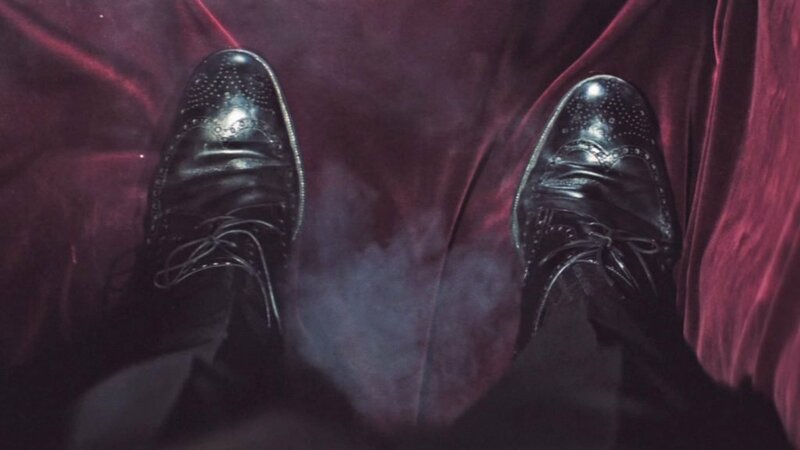 In most other scenes he wears the black full-brogue V-fronts with this suit. Footwear in black suede is an unusual choice for Bond. Black is an all-around atypical colour for suede, also known as “reverse calf” when high quality, which usually comes in shades of brown and sometimes blue. 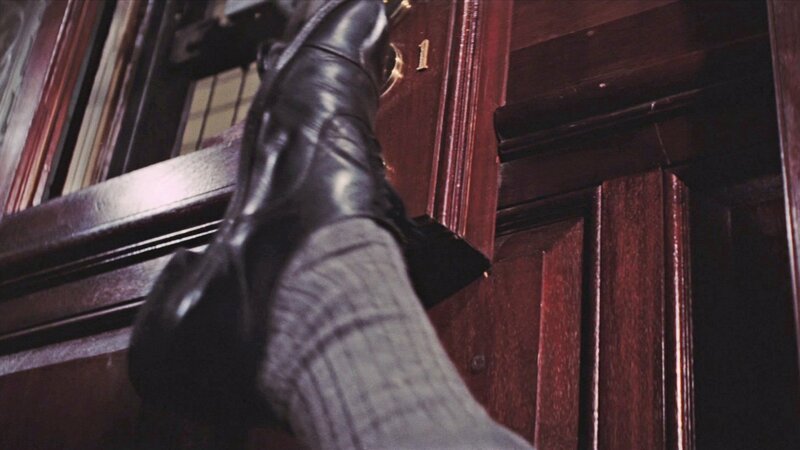 On the few occasions Bond wears shoes or boots of suede, he wears brown suede. These boots look lighter than black because they are coated in the sand and dust of the desert. Sand-coloured suede would have been a better colour for the desert, though Bond’s style is to wear black shoes with grey suits. The Jodhpur boot is a tall ankle boot designed for equestrian sports, and it usually fastens with a strap that wraps around the ankle and buckles at the side. The strap may wrap around the boot in various manners. A key feature of the Jodhpur boot is that the vamp lies over the quarters, which is opposite the way a monk shoe or boot is constructed. For a sturdy country look, the boot has a double leather sole. Jodhpur boots are a very distinctive style and can look extravagant with ordinary clothes away from the country. James Bond pairs these boots with a herringbone tweed half-Norfolk jacket that has many country details, giving appropriate context to the boots. The Chelsea boot, a variation on the Jodhpur boot with elastic side gores instead of a strap, is a more versatile alternative. The John Lobb Bootmaker website does not feature a Jodhpur boot that resembles the one that James Bond wears, but that does not mean they didn’t make it. There are numerous ways to design a Jodhpur boot as long as it is a tall ankle height boot constructed with the vamp sewn over the quarters that fastens with a strap. See jodhpur boots at John Lobb Bootmaker. So the shoes were all John Lobb UK Ltd Bespoke? Wow. Thank you for sharing, Matt! From my little experience with these shoes, I have heard that they can pretty much out last the life of the owner, given just the right amount of diligent care and maintenance. Do you happen to know if the Oakley is a product of John Lobb UK Ltd or John Lobb Paris? The patent leather shoes were possibly not from Lobb, but most of the shoes were definitely theirs. The Oakley is a ready-to-wear shoe, so it is from John Lobb Paris. now I have seen everything? I know Real Life shouldn’t intrude on James Bond, but . . .
How much luggage does Bond take on his missions? We only ever see him with one bag but he must have a train of porters just out-of-frame carrying the trunks holding all his extra suits, dinner jackets, shoes, bathrobes, and tweed shooting-jackets! You’re right It would take a lot of luggage for all that clothing, unless he learned how to pack very compactly… in a large suitcase. Bond really needs to learn the concept of a capsule wardrobe. What do you think Matt? Potential future article? It could definitely be a future article! This is amazing. Such research! And makes me realise just how many shots of Bond’s shoes there are in this film. Nice one! 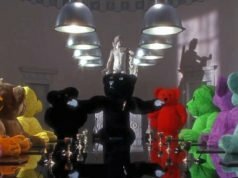 Guy Hamilton either had a great appreciation for the shoes, or he wanted to be sure that every pound they spent on the film appeared on screen! Cutaways of other things like shoes make an action sequence more dynamic. Did Connery use any John Lobb shoes or boots with his navy blazer in the movie? He most likely did, but his footwear is not seen with the blazer. Knowing Connery, more than likely the entire collection of shoes and indeed array of tailoring, comprised his personal wardrovbe for many years after filming wrapped! Thanks for another meticulous post, Matt! Is there much public information about what happened to all of this bespoke footwear (and bespoke garments generally) after filming completed? Is it standard for the actor to keep everything (since it’s constructed for him/her anyway), or, given the expense, do studios or producers haggle about such matters? There’s no public information about what happened to these clothes. Generally the actors may keep some and the studio keeps a lot. 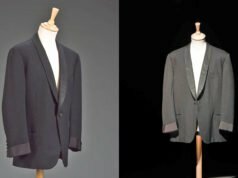 Sometimes the clothes end up in the hands of private collectors, as a couple of Connery’s suits have. Wow, I never even knew there was a John Lobb UK versus a John Lobb Paris. I am shocked. Thanks Matt, very informative! Beautiful shoes but I looked at their prices, yikes!